Scientists are unearthing amazing dinosaurs in a national monument targeted by Trump. Exposed by wind and rain, a two-foot-long segment of a duck-billed dinosaur tail remains embedded in sandstone in Grand Staircase-Escalante National Monument. Scott Sampson hunts for dinosaurs. 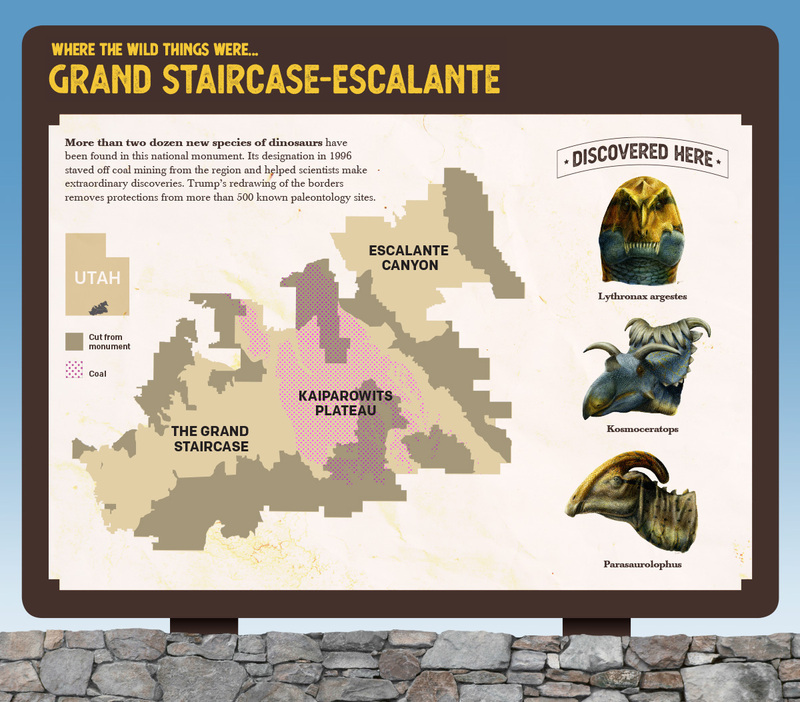 And for the past 19 years, Grand Staircase-Escalante National Monument has been his hunting grounds. He calls the southern Utah canyon country the last great dinosaur boneyard in the United States. Grand Staircase-Escalante National Monument is located in southern Utah. Once, when walking alone there, Sampson spotted fragments of a backbone. His paleontologist’s eye knew immediately they came from a giant duck-billed dinosaur. Stooping, he carefully brushed the loose rock on the ground, exposing several more bones. Sampson pulled some tools from his pack and began carefully removing chunks of sandstone. Hours passed in the desert solitude. Finally, there it was: virtually the entire backbone of the behemoth, speckled with bumps left by the scales of its skin. Sampson’s own skin went bumpy. 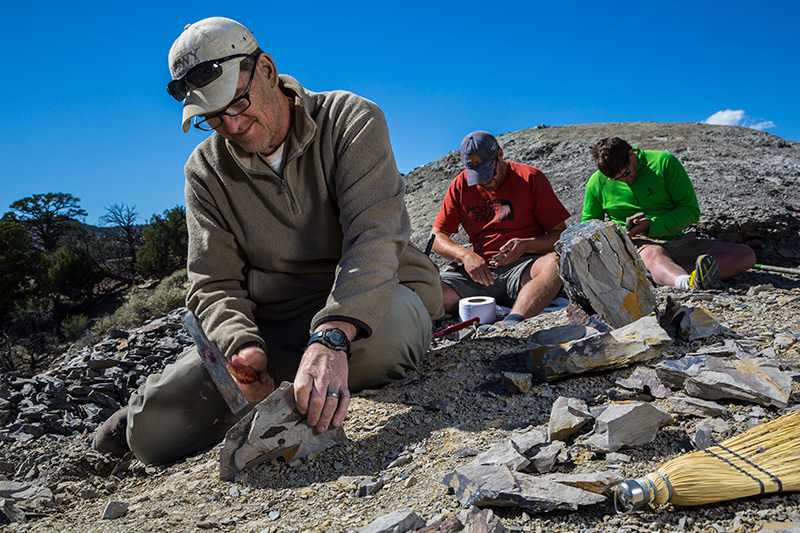 Paleontologist Scott Sampson, left, quarries for leaf fossils in Grand Staircase-Escalante National Monument. Finds like these have opened a rare window to the Mesozoic, a time of global warming that could help scientists understand future conditions on Earth. But further discoveries in Grand Staircase are imperiled by President Trump’s decision to gut the national monument. With the stroke of a pen, Trump revoked national monument status and protection from half the lands in Grand Staircase and the vast majority of another iconic monument in southern Utah, Bears Ears. The Dec. 4, 2017, proclamations stipulated that the lands would be open to mining after 60 days. Within hours, Earthjustice sued the Trump administration to defend Grand Staircase, and followed soon after with a second suit to save Bears Ears. Trump’s actions represent the largest rollback of federal land protection in U.S. history. It’s part of a wider effort to let industry drill, mine and log public land for private gain. Many of America’s most famous national parks started out as national monuments, including the Grand Canyon. Back in the day, not even “the most sublime spectacle on Earth” struck everyone as worth saving. One Arizona newspaper said it was “fiendish” and “diabolical” to designate Grand Canyon as a monument rather than allow mining. We go to court. And we win! Together, we will continue to win. Infographic by Rob Chambliss / Earthjustice. Map courtesy of Dr. P. David Polly. Dinosaur illustrations courtesy of Lukas Panzarin. 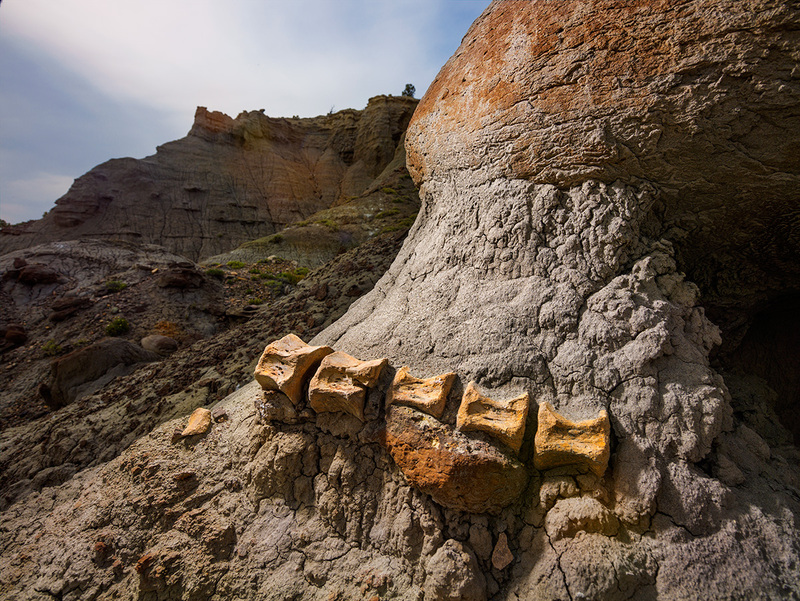 More than two dozen new species of dinosaurs have been found in this national monument. Download PDF. Sampson has already done his fair share of inspiring some of the most curious among us: children. He hosts a television show for kids called Dinosaur Train, tapping a passion he’s held since age 4. “Dinosaurs are bizarre-looking, giant monsters that we no longer need to worry about. What could be more intriguing to a kid?” says Sampson. Some truly wild things roamed in Grand Staircase, sparking the imaginations of kids and adults alike. The tyrannosaur dubbed Lythronax — which means the “King of Gore” — was one of the more than two dozen new types of dinosaurs found in the monument. Picture 2.5 tons of carnivore, jaws lined with serrated teeth capable of crushing bone and ripping off meat by the chunkful. On field trips with local students, Sampson and other paleontologists have had opportunities to explain what a unique part of the world the kids are in. In the Age of Dinosaurs, Earth had no ice caps and an inland sea stretched not far from the east of Grand Staircase. 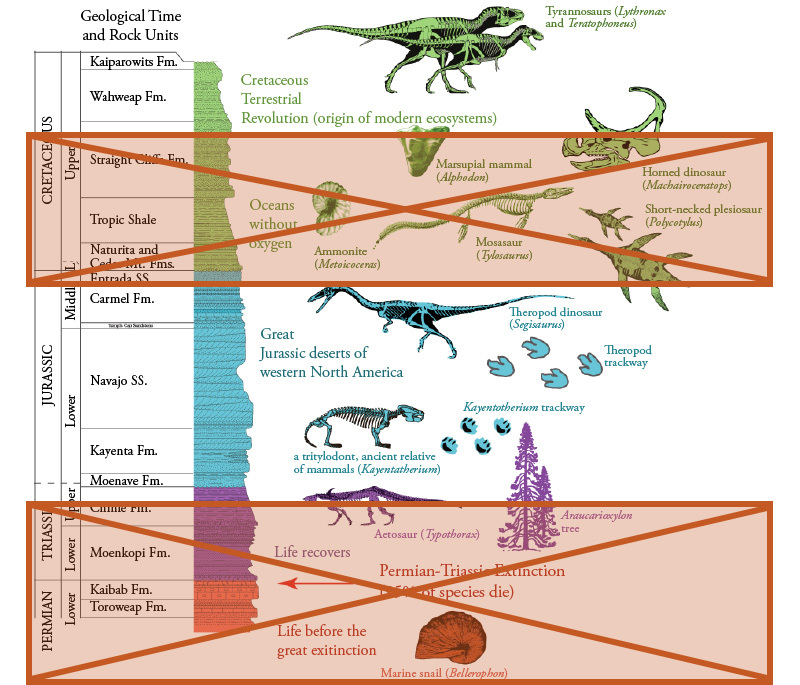 After the dinosaurs died out, layers of earth covered their bones over the ages before geological forces heaved their fossils close to the surface. The southern Utah climate has preserved them exceptionally well. But this unique boneyard is also a coal bed, and for the Trump administration, that’s where the fascination with this place seems to begin and end. There are more than 500 known scientifically important paleontological sites now excluded from the monument, according to David Polly, a paleontologist at Indiana University. A large coal mine almost opened in the 1990s on the Kaiparowits Plateau. 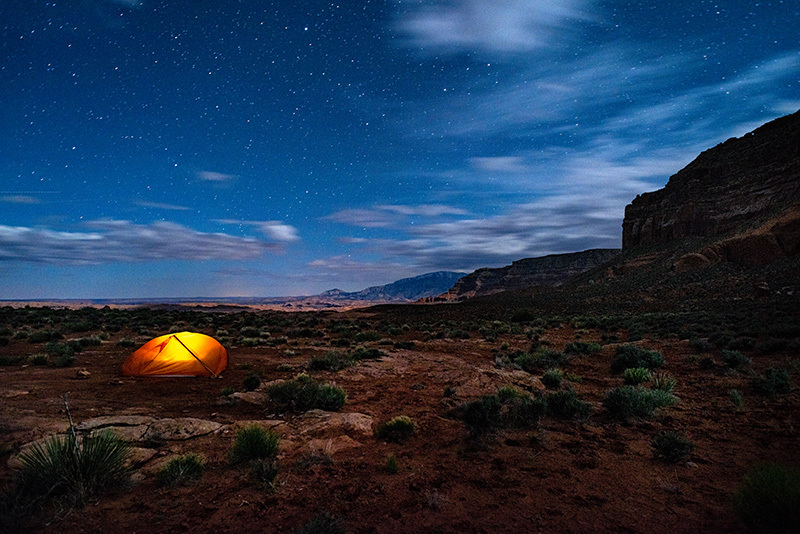 The Earthjustice attorney now leading the national monuments lawsuits, Heidi McIntosh, defeated that coal mine proposal when she worked for the Southern Utah Wilderness Alliance. As a young attorney, McIntosh dug into the mine’s permit application. The paperwork filled binders stretching three feet long on a bookshelf. She brought in experts to help pore through it, including a hydrologist who pointed out the permit did not address the risk that the mine site could be overrun by desert flash floods. Without plans to address flash floods, contamination from the mine could be washed into Lake Powell. Below the Kaiparowits Plateau in Grand Staircase-Escalante National Monument. The detail clicked with McIntosh. She grew up in the Arizona desert. Every summer, her father used his break from teaching to load up the family in a camper and go on adventures across the Southwest and Mexico. She knew the way this land worked — how rain can burst quickly from the sky, race down miles of surrounding sandstone, and funnel onto dry washes that suddenly explode into raging rivers. The flooding potential worried the permit reviewers, too. The legal action around the permit delayed development of the mine, giving President Clinton the chance to designate Grand Staircase-Escalante National Monument. Shortly after, the reviewers rejected the permit, avoiding the possibility of a mine within the new monument. Now, McIntosh finds herself not just fighting to save a piece of a monument but to save the whole concept of monument preservation. Heidi McIntosh heads up Earthjustice lawsuits to protect Grand Staircase-Escalante and Bears Ears National Monuments. Presidents since Theodore Roosevelt have designated 157 national monuments. The constitution gives Congress, not the president, authority over public lands. But in 1906, Congress passed the Antiquities Act, delegating a limited amount of its authority to the president to protect federal lands and waters as national monuments. Congress wanted to give the president authority to act swiftly to ensure that the nation’s natural, cultural and historical heritage was not lost. At the heart of McIntosh’s current legal argument lies the fact that the Antiquities Act does not grant presidents the power to dismantle monuments. Since that power isn’t spelled out, it remains with Congress. Trump’s efforts, therefore, also violate the separation of powers clause under the constitution. Inside the Legal Case Heidi McIntosh explains the legal issues and what’s at stake in the national monuments legal fight. Like Sampson, the legal work McIntosh does today springs from a childhood wonder, in her case the beauty she came to know on long trips in the family camper. McIntosh first met Sampson when she took her young daughter — a huge fan of “Dr. Scott” on Dinosaur Train — to hear him speak at a high school in Utah. Star-struck Julia got to meet her hero. And the lawyer and the scientist began a conversation that continued when they bumped into each other at an event at the Natural History Museum of Utah. From her days fighting the coal mine permit, McIntosh knew that the monument contained a fossil record that existed nowhere else in the world. But as she talked with Sampson in the museum, surrounded by dinosaur skulls hanging imposingly from the walls, the discoveries came to life for her. The museum also became a window for her daughter onto her life’s work. McIntosh had brought Julia to her office before, but the work involved a lot of tapping away in front of a computer screen. Building on this, McIntosh took 7-year-old Julia to Bears Ears. They saw firsthand the archeological sites where corncobs still lay by granary walls. They tracked the lines of ancient structures built by the Ancestral Puebloans over 10,000 years ago and marveled at the petroglyphs. For now, while the courts deliberate over the monument cases, such possibilities for discovery are preserved for the next generation. A version of this story was originally published in the Earthjustice Quarterly Magazine, Spring 2018 issue. Be the first to read stories like this one and support our work to defend national monuments and our irreplaceable wild, with a tax-deductible investment in Earthjustice. Ben Arnoldy is the managing editor. He leads Earthjustice’s print and digital editorial products. Heidi McIntosh is the managing attorney of the Rocky Mountain Office in Denver. 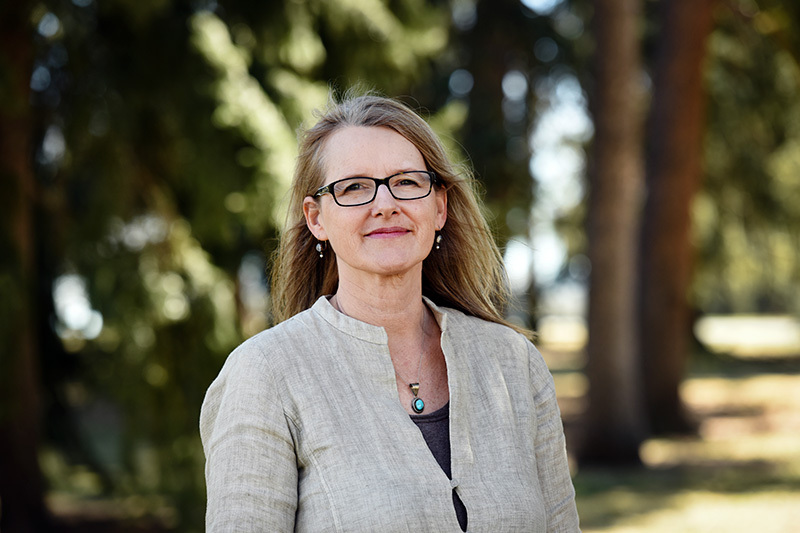 She has more than two decades of environmental litigation experience on cases ranging from threatened and endangered species, to fending off efforts to designate roads and off-road vehicle trails in Utah’s wild canyon country. Earthjustice’s Rocky Mountain Office, established in 1972, protects the region’s public lands and unique wildlife, challenges reckless oil and gas development and off-road vehicle use, and safeguards precious water resources.